Select 'API Access' from the 'Tools' heading in the navigation bar along the top of the Dealer Panel. If API access has previously been set up for your dealership (If you see an access token displayed, or do not see the 'Get API Token' button) please skip to step 6 below. If you have not previously generated an access token, click the 'Get API Token' button. 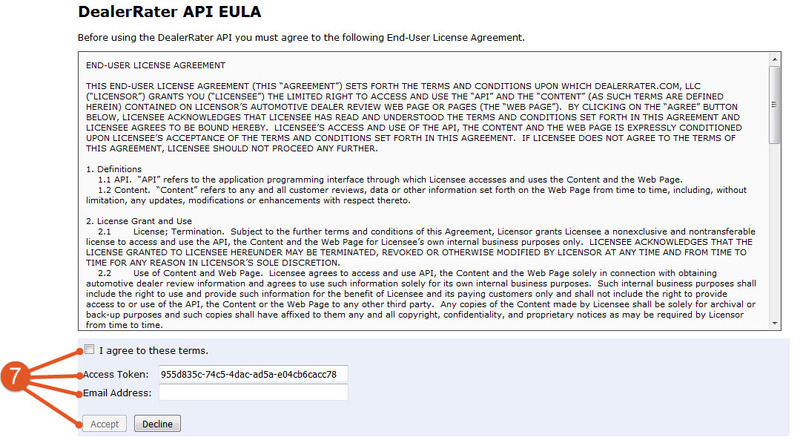 To activate the access token, click the 'Click here to view and accept the EULA' link. Once the access token is activated, click the 'Click Here to see the DealerRater API documentation' link to view information about using the API. Please note that while DealerRater is happy to assist with setting up API access, we are not able to support or assist with individual applications or uses for the API.